Have you ever wondered what it would be like to have a weird pink spaghetti arm coming out of your head that allows you to read minds? No? Just me then. Okay well, how about feeding human arms to crocodiles so you can take it’s teeth, just to give them to a dog so that they can enact revenge on the very scoundrels that abused her as a pup? That more to your liking? Ok, well let’s talk about Zoink Games Stick It To The Man. 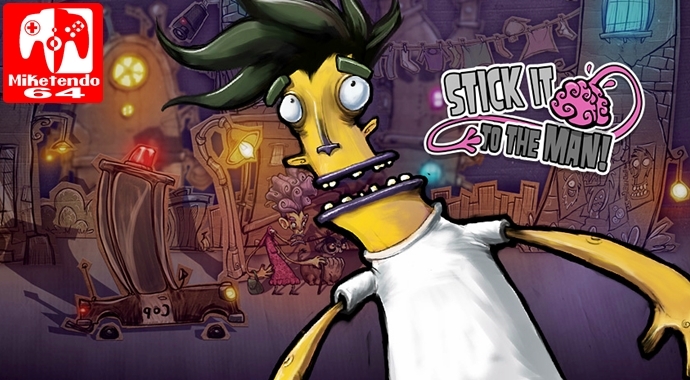 Stick It To The Man is the creation of Indie Swedish Game Development company, Zoink Games. It combines the mechanics of a platformer, with a point and click adventure along with an intriguing and mind-boggling story to boot. With puzzles that will keep you entertained throughout the game. Originally released on the Wii U amongst other consoles and of course Steam, Stick It To The Man has now come to the Nintendo Switch so if you haven’t played the game before, allow us to fill you in. You take control of Ray, a hard hat tester who is ironically hit on the head by a falling object that seems to be government property. After awakening from what he thought was a hallucinogenic dream. He finds that a giant pink arm has sprouted out of his head and that something has gone into his brain. This arm grants Ray the power to read people’s thoughts and collect stickers which, when placed in their allocated places will help initiate key events that will allow Ray to continue his evasion from the unknown henchman hunting him down and the orderlies from the funny farm that just want to give him shock therapy. Set in a 2.5D world that looks like it was paper-crafted together and is the general theme of the game as you swing from platform to platform via drawing pins, peel back loose panels like pages in a book and collect stickers to use where prompted. When you die or fail, you are brought back to life at the last checkpoint/copy machine by being unrolled on a sheet of paper, keeping with the aesthetic of the game. The setting is 2D but the story has a unique depth to it and every character has their own quirky personality. The visuals are sharp and colourful and the humour of the game will keep you amused as you play. If Tim Burton was to try his hand at video games, it would definitely be on along the lines of Stick It To The Man. The controls to the game are relatively straight forward and pretty responsive, there does seem to be a deception in depth though, as sometimes there are jumps that should be impossible to do but can be done with ease but that could just be me. Controlling the spaghetti arm can be a bit awkward at times as it doesn’t always go where you would like it to. Trying to find read each of the minds of the characters, especially those gathered quite close together can be difficult at times as leaning a smidge too far on the right joystick may miss the mind you want to read and not bring up the circular cursor to fulfill the command you are hoping to do. The music is whimsical and quirky and really does add to the oddity of the game, changing in respective of the storyline, becoming light at heartwarming moments and rather dark as the tone of the game gets grim. The voice acting can be a little grating at times and Ray’s voice can get a little annoying as he is supposed to be a grown man but it seems his voice has yet to drop. Regardless, Ray is still a relatable guy with a big heart and a penache for making things right even though he is being chased by an anonymous chainsmoker and his goons. The puzzles are the main focus of the game as you have to find stickers dotted around each level, normally pryed from the thoughts of the minds your character reads. There is a lot of to-ing and fro-ing from one side of the level to the other and back again which will have you exploring every nook and cranny you come across just to find a pair of legs for the poor deceased magician’s assistant who lost her legs and died when her partner cut her in half for a trick. You are not given the full picture either and you have to work out most of the pieces on your own with very little handholding. It does help you realise that you are in fact just a part of a much bigger picture as you help people with their daily lives like rescuing people trapped in car trunks by gangsters, help a psychologist reconcile with his deceased father, rekindle the love between an unhygenic loser and a dentally superficial disco dancer. A fun romp with metroidvania style gameplay and a unique story that would make Tim Burton proud, Stick It To The Man is a welcoming title to the Switch. Though it has little replayability after playing through the 5-6 hour story, It is a nice title to get lost in if you are waiting for the upcoming spiritual successor, Flipping Death. The switch is home to a great many titles and weird and wacky games like this one are easy enough to pick up and play at any time, wherever you are. Though I personally am not keen on some of the voice work, the characters are charming, quirky with plenty of wit and dark humour.